A 19th Century Bodge Job? When we began designing the new academic building to replace the eastern end of the Rank building, there was an idea that we would strip away the back wall of No 31 Jesus Lane to leave a beautiful 18th century brick wall, which would serve as natural backdrop to the main stairs. As you can see from these photographs, reality is somewhat different. The photos are taken from a point which is just inside the door of No 31 on the second floor of Rank, and the wall backs on to what was Cindy’s study. 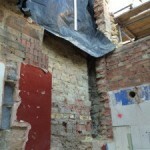 We have gently stripped away the layer of 1970s brickwork to see what is underneath. 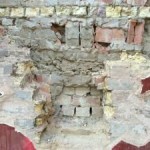 And what is underneath includes a few 18th century bricks, that is true. But it also includes 18th century bricks in 19th century cement, some early 19th century flettons, a couple of very 20th century red bricks (not quite aligned with the rest of the brickwork), a bit of rubble (undated) and a wooden post which had our structural engineer a bit worried for a moment in case it was supposed to be supporting something. 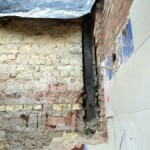 I think we will just put the steelwork carefully around the wall and cover it back up!